Bailgate Court is a collection of 14 beautiful and exclusive homes in the heart of Lincoln, with exceptional views of Lincoln Cathedral, Castle and City. Bailgate Court is nestled in a perfect setting amid beautiful landscaped gardens, just off the bustling Steep Hill (UK’s Best Street, 2011) only steps away from Lincoln’s thriving Bailgate and Castle Square. Bailgate Court is a development where history meets modern and elegant design, created to reflect the highest standards of contemporary living while maintaining the beautiful original features of this stunning 18th Century building. These high quality, spacious and well-thought out homes really are luxury living at its best. Lincoln is a City rich in history, arts and culture along with a wealth of places to eat, drink and shop. Bailgate Court is in the centre of uphill Lincoln and you will rarely feel the need to use your car. Lincoln’s history can be dated back to the 1st Century BC with settlement around the Brayford giving name to Lincoln’s original title Lindon from “Lindo” which from the Celtic language means “the pool”. Lincoln has been home to Romans, Vikings, Saxons, Normans and many other civilisations. The Romans first settled here around AD50 and built a fortress on the hill later turning it into a colonia (retiring home for soldiers). Lindon was latinised to Lindum Colonia. In 1068 William the Conqueror arrived and ordered the building of Lincoln Castle and Cathedral on the site of the former Roman Settlement. Lincoln Cathedral became the world’s tallest building in 1300 until 1549 when the spires collapsed during a storm. nickname of ‘Bomber County’. Now, Lincoln is home to one of the UK’s fastest growing modern universities and is still a world leader in the engineering industry. Today, Lincoln has a wealth of high street shops, independent boutiques, tea rooms, restaurants and historical sights. Steep Hill which connects the historical Cathedral Quarter known as ‘uphill’ and the main shopping area known as ‘downhill’ Lincoln, was voted as Britains Best Street and is only steps away from Bailgate court. Exceptional homes with stunning views of Lincoln Cathedral, Lincoln Castle, the City and countryside beyond. Live in style and comfort; take in the beautiful historic surroundings from the tranquility of your home, while being only a stones throw from Lincoln’s vibrant Castle Square, Steep Hill and the Bailgate where you’ll find restaurants, shops and both the Castle and Cathedral. In the summer months, take to your terrace to enjoy the incredible views and this fine city’s ambience. 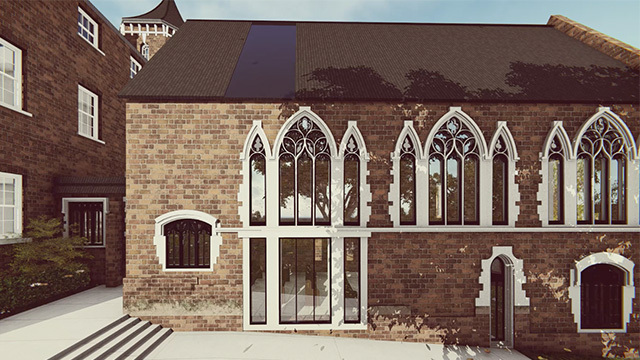 Bailgate Court will comprise 12 large apartments, a converted chapel and an elegant 4-bedroom town house, all set in landscaped gardens, only moments from the bustling Steep Hill with exceptional views of Lincoln Castle and Cathedral. This remarkable historic building offers prime central uphill living along with exclusive design by award winning architects. These homes have been thoughtfully designed to provide contemporary living in harmony with the beautiful period features of the property and the bespoke luxury interior finish to your specification. Both the internal modernisation and the impressive North elevation have been designed by Jonathan Hendry, RIBA and National Housing Award winning architect. The enormous open-plan kitchen and living space enables modern living, maximises light and perfectly balances the high ceilings. Bespoke, handmade kitchen’s will be designed to suit your style and requirements and only the very best materials used throughout. This stunning 18th Century building has been given a new lease of life and perfectly lends itself to creating luxurious homes. No stone left un-turned, you will be offered top ranges of appliances and every inch of the home has been considered to maximise storage, light and functional every day living. Bailgate court is an exclusive Grade II listed architecturally inspired development in the heart of Lincoln’s Cathedral Quarter. The building was originally constructed in 1777 as Lincoln County Hospital to a design by John Carr of York and William Lumby and later acquired by Lincoln Theological College in the 1870’s for ecumenical training when the hospital moved to Sewell Road. The attached wardens house and octagonal water tower are late nineteenth century and the Chapel added in 1906 to a design by Temple Moore and the late rear addition (which has now been removed) was built in 1962. The main building is south-facing and consists of a three-storey, eleven-bay façade with projecting pedimented centre and flanking wings. The building has been occupied by Lincoln University and later Lincoln University Technical College since 1995 under the name “Chad Varah House”, also known as “ Bishops Hostel” after the Samaritan’s founder who was educated at the Theological College. All interior finishes will be to the highest standard, while maintaining the stunning original features of the building. You will have a choice of internal paint from a range of colours. Flooring throughout can be chosen from a range of tiles, carpet and engineered wood to maximise durability, elegance and functionality. Top quality stainless steel/ chrome switches, media panels and sockets will be used throughout; all to be recessed into the walls where possible. Fitted wardrobes will be incorporated in all bedrooms to maximize storage space and style. Any changes, additional paint colours, wallpapers, curtains, furniture and soft furnishings can be organised through our in-house interior design team. High quality and energy efficient heating systems will be installed in each apartment. This includes high performance under floor heating in all areas as standard along with a remote automated heating system installed. All bathrooms will have heated towel rails (electric). In-keeping secondary glazing to be provided for heat and sound insulation on the South elevation where the original windows have been restored and highly efficient new modern insulated windows installed on the new North elevation. If you wish to have additional heating services, such as a gas or electric fire/ stove we can try and accommodate these as much as possible. Energy efficient LED spotlights, wardrobe lighting, ceiling up-lighting, terrace lights and entry door lights are included in your apartment, creating a natural and light atmosphere for your living space. All apartments will be wired for a SONOS sound system, FIBRE broadband, TV and telephone, to accommodate modern living. Safety and security of our residents is a top priority at Bailgate Court. Each apartment will have a video phone intercom for visitor access which will be security controlled to all building entrances and the car park and CCTV surveillance will be installed to public areas and car park for maximum security. Each apartment will have fire and heat detection and alarm systems. Communal areas will be fitted with emergency lighting. All front doors will be fitted with heavy-duty 5-lever mortice lock and door chain with spy hole. Nearly all bedrooms have an ensuite bathroom to accommodate modern living and maximise privacy. You will have a choice of bathroom sanitary ware style. We will suggest only the top ranges and advise on fittings to maximize storage space and functionality as well as style. All bathrooms will be fully tiled to your choice from our wide range of high quality, elegant tiles. Bailgate Court is in the most sought-after area of up-hill Lincoln, with the North-East corner on Steep Hill; moments away from cafes, bars, shops, restaurants and the river . We look forward to welcoming you to Bailgate Court!